John and Edward made a surprise guest appearance today, on ITV’s Morning show This Morning, and showed just how “Jedward” they can be! The show has been running a competition for a member of the public to be a presenter for the day, and the talented twins were set the challenge of giving the final three an interview they’d never forget. They distracted, interrupted and evaded for all they were worth, John even serenaded one lucky contestant with his acoustic guitar! 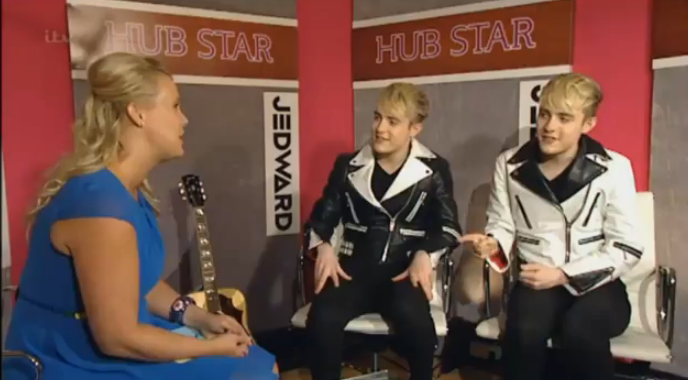 After putting the three hopefuls through “Jedward Hell”, John and Edward sat calmly discussing who had done the best Job. I was pleased to see Maddy, who had been warm, friendly and managed to extract some proper information, turned out to be both John and Edwards, and they viewers choice, and therefore won the role. The twins did a great job and showed how truly professional they really are!